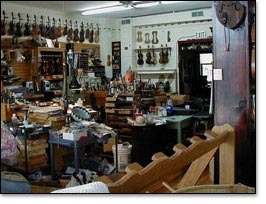 The workshop at Geoffrey J. Seitz, Violinmaker, is unique in that the work that goes on in the shop is completely visible from the retail area as well as from the outside. The shop has beautiful natural lighting and special full spectrum lamps that assist Geoffrey and his colleague Marc to do their top-notch work. Many operations occur on the benches, from simple adjustments to full scale restorations. The shop is also equipped for our expert custom building of beautiful violins, violas and cellos. 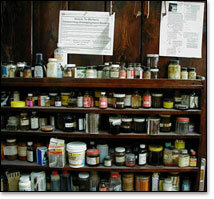 This shows some of the many pigments and varnishes used in the shop. It's a virtual apothecary. Because there are so many different types of instruments with different types of finishes, we need to keep a varied collection of products for touch-up and repair. We also hand make our own varnish formula for the instruments we construct.